Published: Sept. 18, 2016 at 10:51 p.m. Updated: Sept. 20, 2016 at 01:22 p.m. Opportunity is the name of the game in fantasy football. Talent matters, of course, but we want players who see a healthy volume of targets and touches to anchor our lineups, especially in daily fantasy. Every week in the second season of the Opportunity Report, we'll look at all the passing targets for every NFL team and the percentage each player owns. Franchise will handle the backfield touches section this year and his Week 2 piece is tabbed above. After Week 2 we have even more new data to work with and can dig into the passing distribution for each NFL team. We're trending far more towards the territory where we need to believe what we are seeing in these distributions is the new reality we should adopt. Jaron Brown played 29 offensive snaps to 28 from John Brown and the Cardinals were out in their two receiver set at a higher than expected rate once again. I'm out of explanations for what's going on with John Brown, we'll just have to wait and see how this plays out. For now, Larry Fitzgerald and Michael Floyd are the clear-cut top two threats in this receiving corps, but David Johnson is quickly establishing himself as the best running back in the NFL. He's doing everything and is a near unstoppable force. It's a good thing that Julio Jones is making due for fantasy with two touchdowns in two weeks, because the volume just isn't there right now. Jones never went two games in a row with single-digit targets last season but now has eight and five targets the last two weeks. Jones has been in and out of both games with an injury so he should return to being a target hog once he's healthy. Sanu also came into this spot with an injury but was much less of a factor than he was in Week 1. He's not an every-week fantasy play. Last week we noticed that Dennis Pitta played more snaps than not only any other Ravens tight end, but even more than any of their wide receivers. This week that playing time turned into production as he held a 26.7 percent share of the team targets and was Joe Flacco's preferred target. Steve Smith and Mike Wallace are still the top two receivers here and their snap percentage increased from 66 and 65 percent in Week 1 to a 71 percent share for both. Breshad Perriman's work also increased going from 31 percent in Week 1 of the snaps to 41 percent in Week 2. It's clear the team wants to work him in more and right now that is coming at the expense of Kamar Aiken, whose snap rate dropped from 53 percent in Week 1 to 41 percent in Week 2. Two games are enough to see where Aiken's stock currently sits. A favorite of the NFL Fantasy Stronghold, so it hurts to say, but Aiken can be released to the waiver wire if you were still holding on. However, this rotation should not be viewed as a settled deal, especially with Smith's age and Wallace's shaky history. Perriman especially deserves monitoring as the season goes along. Keep him on speed dial. Whether for a health or any other reason, Sammy Watkins was not a big part of the game plan in this one. The Bills are in a bad place and fired their offensive coordinator after an 0-2 start and appointed their assistant head coach/running backs coach Anthony Lynn as their new offensive coordinator. Lynn is a former NFL running back himself in addition to coaching the position throughout his career. It's unlikely that he pumps much more volume into the passing offense, and that would be outside of Rex Ryan's M.O. either way. For the second week in a row, Kelvin Benjamin led the team in targets and went off for a big game. He and Cam Newton are dialed in right now and he's still not even playing a full helping of snaps (63 percent). He's an every-week WR1 at this point as the clear top target for one of the NFL's best quarterbacks. Devin Funchess played more snaps than Corey Brown and Ted Ginn, but a fair amount of that came as a blocker in single wide receiver sets. He also snared a late touchdown pass. Funchess is worth hanging on to as an upside flier if Benjamin were ever to get hurt but he can also be dropped if you're chasing someone with a more locked-in target share or an ascending backup running back. Through two weeks Alshon Jeffery only holds a 22.8 percent share of the Bears passing targets, which is a far cry from the dominant 31 percent share he garnered in his nine healthy games from 2015. Jeffery balled out early in the game, catching a 49-yard bomb and then drawing a pass interference penalty in the end zone right after which set up a goal line rushing touchdown. Yet, because they didn't feed him in the second half for a consecutive week, Jeffery finished with "just" five catches for 96 yards. In the preseason Jeffery looked like a locked-in high-end WR1 as a target hog, but that hasn't been the case thus far. However, with Jay Cutler expected to miss multiple weeks and Brian Hoyer now the Bears starter, there is some reason for hope this turns back around. Hoyer rightfully had tunnel vision for DeAndre Hopkins last year and could develop the same for Jeffery as no other Bears pass-catcher emerged as an option to command targets through two weeks. This was the type of passing game usage many hoped for from Giovani Bernard after the mass exodus of receiving talent from the Bengals roster. Bernard had a game in 2015 when he posted 120-plus receiving yards, so this sort of game is not completely out of left field. However, it's not an event we should be looking for him to repeat on anything close to a consistent basis. The Bengals are in the midst of a brutal stretch of tough run defenses. It's well within reason to expect Jeremy Hill to hold a bigger role in the mid-range of the season. This was a low-scoring game between two division rivals. 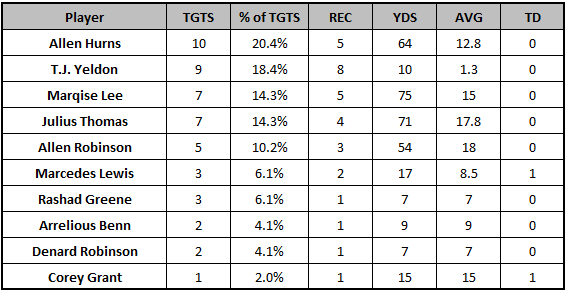 We should expect the passing game distribution to look more like what we saw in Week 1 for the Bengals. This was the Corey Coleman coming out party. Terrelle Pryor led the team in targets but eight of his 10 came in the second half as the Browns tried desperately to hold off a Ravens team chipping away at their early established lead. Coleman looked like a special athlete on both his deep touchdown and short screen scoring reception in the red zone. He has game-breaking ability and week-winning upside in every contest. Josh McCown opens up this offense much more than any other quarterback for fantasy purposes. However, he's already nicked up which means the reigns could be passed to third-round pick Cody Kessler. We're reaching dangerously close to "it is what it is" territory with Gary Barnidge. It does not appear he's headed for the volume he saw in 2015. 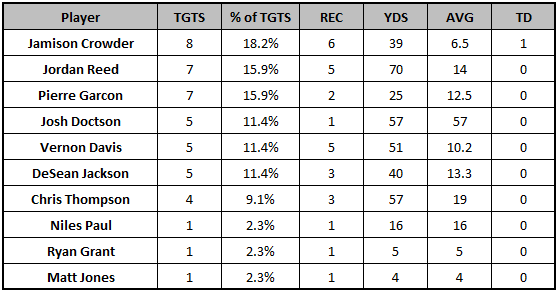 After a week of hand-wringing, this is what we needed to see in terms of target distribution for Dez Bryant. Dallas did indeed funnel the passing offense through him, with 40 percent of the targets going his way. Prescott looked more comfortable throwing the ball down the field in Week 2 after some hesitancy in Week 1 against an improved Giants defense. Bryant has even more blow-up potential in better matchups on the upcoming schedule. Josh Norman only gave up one target and no receptions on the few pass plays he covered Bryant, per Next Gen Stats. Dallas' Sunday night tilt with the Bears in Week 3 is a spot where Bryant could go off. Elsewhere it does seem that Prescott wants to continue looking for his short dump-off options, as Cole Beasley has a team-high 18 targets through two games. He's only being targeted on average 7.6 yards down the field, so he's clearly the preferred safety valve for the rookie passer. Expect Beasley to maintain this role going forward. It is a little surprising that Elliott has just three targets in two games. With the way the Broncos are playing offense their receivers need to hit a big play in order to access their ceiling. Demaryius Thomas did that in snaring a 44-yard reception on his first catch of the day. However, he was both out-targeted and out-snapped by Emmanuel Sanders. C.J. Anderson had three catches on five targets after catching four in Week 1. He has a clear role in the passing game and hasn't been challenged in the slightest by rookie Devontae Booker. Through two games Marvin Jones owns a 28 percent share of the Lions targets and he is the only player with an average depth of target higher than 10 yards in both games. Any question as to who is the top target in Detroit can now be put to rest: Marvin Jones is clearly the No. 1 receiver there. Tate's unusually high average depth of target of 19.1 may explain his disastrous line in converting only two of his nine targets into receptions for just 13 yards. Typically, the Lions utilize tate much closer to the line of scrimmage. However, Tate's floor is frightening as a secondary target in the passing game with a low-ceiling slot receiver's type of usage. The Packers offense is in no way shape or form "back" just yet. Jordy Nelson led the team in targets and played 96 percent of the snaps. Perhaps a third week back in the lineup for Nelson is just what the doctor ordered, but frankly problems have also been behind center. It's clear Aaron Rodgers is forcing the issue and looks rushed behind an offensive line going through changes. There's really no good answer as to why the team continues to throw around seven targets per game at Davante Adams. The definition of insanity is doing the same thing over and over again and expecting different results, after all. We're nearing the point where we can call the Texans a highly-concentrated offense that primarily flows through two pass-catching options. For the second straight week DeAndre Hopkins absorbed over 50 percent of the team targets, with a 53.4 combined share in Week 1 and 54.5 percent on Sunday. Fuller led the way in the opener but it flipped back Hopkins' way in Week 2. No other Texans receiver or tight end has more than three targets in either of the first two games of the season. We know Hopkins is great and a WR1 in fantasy but it is Will Fuller's emergence that is the real story. The first round pick has gone over 100 yards in each of his first two NFL games and has an average depth of 23.5. That's an outstandingly high figure for someone who is also amassing steady production. Fuller has the most targets (18), catches (nine) and yards (211) among the eight wide receivers who have an average depth of target figure higher than 20. The Colts offense was decimated by Von Miller and the Denver front seven. They could not mount much of anything on offense as the Broncos defense didn't lose a step in the offseason. Donte Moncrief left this game with a potential concussion and is going for an MRI this week. Phillip Dorsett would ascend to the starting lineup if he missed time. Jack Doyle was a big part of the offense again playing 62 percent of the snaps. That may have been a factor of Moncrief's injury as he played just nine snaps. Jacksonville got worked over by the Chargers in a cross-country road trip. Jason Verrett essentially blanked Allen Robinson until the fourth quarter, showing what a dynamic force he is at the cornerback position. We're far from at a point where we're giving up on Allen Robinson, however. He has dates with the Ravens, Colts, Bears and Raiders upcoming on the schedule. Jeremy Maclin saw a whopping 15 targets after garnering just seven in Week 2. The Chiefs couldn't mount or sustain much offense today, and Maclin started painfully slow. Four of Maclin's six catches came on the final two Chiefs' drives that took place in the fourth quarter. 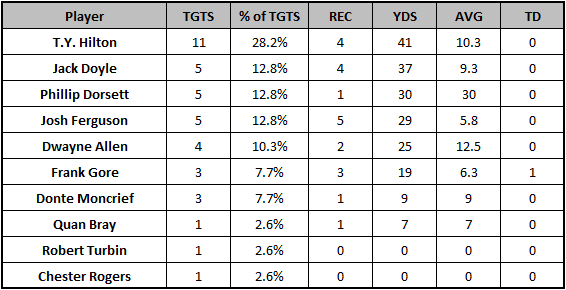 However, this was the type of target share and usage we envisioned for the veteran receiver as the team's clear No. 1 threat. Spencer Ware continued his involvement in the passing game, maintaining his safe floor. He went for over 100 total yards once again this week. With Alex Smith's attempts down to 37 after going for 48 in Week 1, we saw less volume go the way of ancillary players like Chris Conley. While a 40.5 percent share for Maclin was aggressive, this is the sort of distribution we should expect for the Chiefs on a week-to-week basis. Kenny Britt has a 67 and 94-yard contest on his resume in each of the last two weeks. He's the only Rams wide receiver who sees anything close to requisite targets. Los Angeles also opened up their passing offense, at least for them, in Week 2. Case Keenum's average depth of aimed throw jumped from 6.0 in Week 1 to 9.5 on Sunday. Perhaps in leagues that start more than three wide receivers, Britt is worth a desperation heave. Offseason narratives of Tavon Austin taking another step and Todd Gurley's passing game work can be put to bed at this point. Austin chipped in just eight rushing yards in the first two weeks to supplement his mediocre receiving workload. DeVante Parker's emergence in the pecking order was quite encouraging. After a poor offseason and being inactive in Week 1, Parker tied for the team lead in targets and played 92 percent of the snaps. The Dolphins tipped their hand against the Patriots as they played with three wide receivers on the field on 55 of their 61 plays run. Even if Parker is not the nominal No. 2 receiver, and Kenny Stills did out-snap him, it looks like Parker will see more than enough chances to get on the field. The one caveat to all of this comes with the reality that the Dolphins fell behind 24-3 in the first half, but that might be something that happens often. Jimmy Garoppolo knifed through their secondary with ease en route to a 234 yard, three-touchdown first half line and LeGarrette Blount put them away with 29 carries for 123 yards. The Dolphins look like a team who will need to take to the air often, and their stable of running backs, Jay Ajayi and Kenyan Drake, rushed for just 26 combined yards after Arian Foster went down with an injury. Stefon Diggs is a star. He absorbed 35.5 percent of the team targets after handling 27.3 percent in Week 1. Diggs also went over 100 yards for the second straight week, as well, and made dynamic catch after dynamic catch while tearing through the Packers secondary. At this point, you need to find a way to get him in your lineup every week, especially with the dialed-in chemistry he showed with new starting quarterback, Sam Bradford. 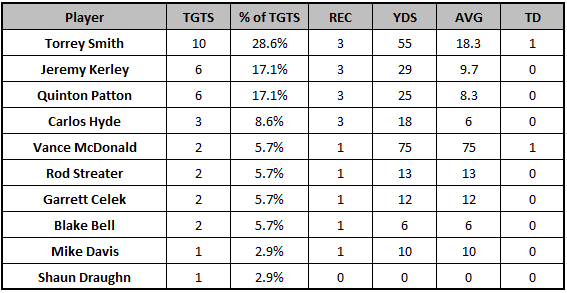 The Patriots distribution looked similar to Week 1 with the exception of Martellus Bennett, who was more of a big performer in the passing game. Bennett ran 25 routes and played on 36 passing plays, almost the same ratio as last week. However, he made the most of his opportunities in this spot. It's hard to project Bennett's role when both Tom Brady and Rob Gronkowski return to the offense but this was a reminder of his potential. Chris Hogan played the same amount of snaps as Julian Edelman whereas Danny Amendola played on just 24 percent. Make sure you aren't chasing his points. Willie Snead reminded us that his explosive Week 1 wasn't a fluke, not that anyone should have believed it to be. Snead played the most snaps (87 percent) of any Saints pass-catcher in Week 2 and tied for second on the team in target share. The player he tied with, Coby Fleener, was once again a disappointment. Fleener's snap percentage dipped from 81 to 75. You have to wonder if he begins to lose more playing time after posting three catches in two weeks against what were theoretically good matchups. The New York Giants might have the NFL's best No. 1, 2 and 3 receiver lineup right now. The team knows it too. The Giants ran a three wide receiver set on 71 of their 76 plays on Sunday. With Odell Beckham, Sterling Shepard and Victor Cruz handling 65.5 percent of the team targets, no other pass-catcher truly needed to be involved. This matchup with the Saints beat-up secondary was a pristine spot for them to all put up usable numbers, so we can't expect that every week, but this is a talented unit that will be on the field a ton together. All three members of the Giants wide receiver trio will merit weekly starting consideration in fantasy. We talked all offseason about how the Jets were such a highly concentrated offense. Brandon Marshall and Eric Decker saw over 50 percent of the team targets and are still well established as the top two wideouts, but a third option has emerged. Quincy Enunwa has 14 targets on the year and he's caught 13 of them for 146 yards and a score. The Jets found a unique way to use the 6-foot-2, 225-pound player. Through two weeks he took 59 percent of his snaps in the slot and 12 percent lined up tight to the line. He carries a huge size advantage in the middle of the field and it certainly shows. We should expect him to remain a regular part of the rotation going forward. For the second week in a row Amari Cooper led the team in targets. He's fully surpassed Michael Crabtree for the right to be this team's No. 1 receiver, but he still has yet to register a reception in the red zone despite seeing two targets through the first two weeks. Cooper's usage so far has been encouraging in his quest to become a top-10 producer at the wide receiver positon in the NFL. He was just a hair away from having a massive game on Sunday and beat Desmond Trufant at least once for an impressive reception. Seth Roberts is still a big factor, tying for third on the team in passing targets and currently owns the lead for red zone looks. If either of Cooper or Crabtree were to get hurt, he would be priority add. Jordan Matthews is the target hog of the Eagles passing offense and a high-end WR2 in fantasy, at worst. The third-year pro could have posted an even bigger line had he not dropped a sure-fire late second-quarter touchdown pass. Don't let that cloud your vision of Matthews, who has played quite well and is moving around the formation. No longer just a slot receiver, Matthews played 48 percent of his snaps out wide on Monday and 46 percent in the slot, while collecting 37 percent of his yards out wide, and 63 percent in the slot. Dorial Green-Beckham played on 46 percent of the snaps and was still behind Nelson Agholor (78 percent). Agholor garnered a red zone target but failed to haul in the contested catch, but made another fine reception over the middle while Carson Wentz was rolling out. With Wentz playing with poise and aggression, the Eagles receivers are much more viable than we expected. We'll chalk this up as an outlier game for Antonio Brown, who has a dicey history against the Bengals recently (averaged just 67 yards against them in 2015). 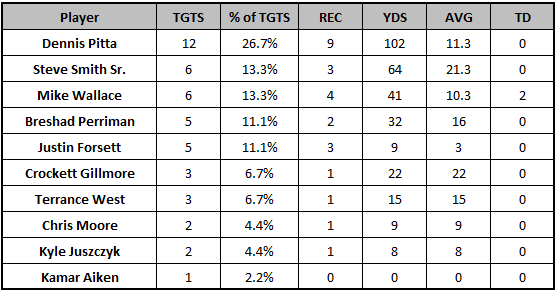 We also still should be wary of looking to Sammie Coates for predictable production. He still played on fewer snaps than Eli Rogers (just 47 percent) and registered a 39 average depth of target. He hauled in two of those big catches, which was at least better than his usual habit of painful drops. However, he doesn't have a consistent or secure enough role to look at as a weekly option, even though this was a positive indicator for his standing with team. His usage when Markus Wheaton returns will be worth monitoring. For the second week in a row, Jesse James played 100 percent of the snaps. This time he turned his red zone usage into a nine-yard touchdown. James has touchdown upside every week as long as Pittsburgh continues to deploy him as they have in the first two weeks of the season. The Chargers blew out the Jaguars so they only needed to attempt 24 passes. Both Travis Benjamin and Tyrell Williams made the most of their limited work, especially Benjamin who scored on a red-zone crosser and a deep shot. He has a real and tantalizing ceiling every week in this offense while attached to Philip Rivers. Williams was second on the team in terms of wide receiver snaps and scored on a short crosser that he took 44 yards to the house. He's a dynamic athlete with incredible length. He has breakout potential as long as he keeps improving. One weeks after sweating Torrey Smith's usage, the 49ers fed him 10 targets at an average of 17.7 yards down the field. Smith streaked past Panthers rookie corner James Bradberry for a touchdown on a post route. While Smith might not crush his ADP with Blaine Gabbert still not a pristine downfield passer, this was enough to know he still has the role and weekly ceiling to keep him on our rosters. Jeremy Kerley had a down game after a strong 49ers debut last Monday night. This game reminded us he's still a fringe rosterable player. The volume is there in the 49ers offense (fourth in plays run heading into Monday Night Football) but the efficiency isn't good enough for both Smith and Kerley to go off on a weekly basis. Vance McDonald raced in for a 75-yard touchdown and now has two scores on three catches this year. He played the most snaps of any 49ers tight end, but with a lack of targets going his way on a routine basis it's hard to count on week-to-week production. Tyler Lockett missed the bulk of this game with a knee injury playing just 41 percent of the offensive snaps. However, he made the most of his time on the field hauling in all four of his targets for 99 yards. After seeing his talent on display in this game after more encouraging usage than expected in Week 1, we can still feel good that better days are ahead for Lockett. If his owner in your fantasy league is getting frustrated because he hasn't exploded yet, make sure you swing a deal for him immediately. Jimmy Graham might not be fully healthy, but he's on the field plenty. He played 82 percent of the snaps in Week 2. It's just hard to tell yourself a story where we ever see the statistical dominance Graham once treated us to in his days in New Orleans as long as he's on the Seahawks. Through two weeks it is painfully apparent that Mike Evans has taken over the job of the Bucs No. 1 receiver with vigor from Vincent Jackson. Despite seeing strong coverage from Patrick Peterson Jameis Winston still funneled targets to Evans. The big third-year wideout has a touchdown in back-to-back games but has not cracked 100 yards yet. Fear not, that is well on its way too. Charles Sims had a poor game against a tough front but with Doug Martin on the injury report with a hamstring malady, expect him to show up big in the receiving department in Week 3. We still don't have much of a clue where this tight end battle is heading. Austin Seferian-Jenkins played the most snaps (34) but only edged out Cameron Brate (33) by a single snap. Right now the Titans don't have enough of a downfield element to their passing game. Tight end Delanie Walker was the only player who averaged more than 10 yards per reception in Week 2. This is the second week in row where Tajae Sharpe held a greater than 20 percent share of the passing targets and was the highest-targeted non-running back. 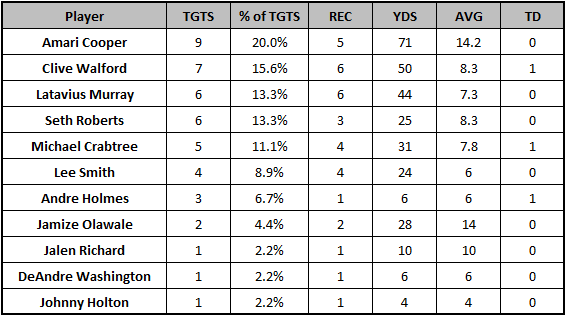 Through two weeks Jamison Crowder leads the team in wide receiver targets with 18. He also played more snaps (72 percent to 69 percent) than Pierre Garcon for the second straight week. Crowder has an average depth of target of just 7.8 so he doesn't have a tremendous weekly ceiling, but it's clear he's a preferred target for Kirk Cousins and should maintain a safe floor of production. Jordan Reed has not torn through the first two defenses he's played but that's primarily due to Washington's overall abysmal performance in the red zone. Through two games Kirk Cousins has attempted 17 passes in the red zone (tied for second-most among quarterbacks) and completed just 29.4 percent of them with one touchdown and two interceptions. Reed is tied with rookie Josh Doctson in red zone targets with three behind Jamison Crowder (five). Washington dialed up multiple "trying too hard" fades to Doctson yesterday. The team needs to do something to reconfigure their red-zone play calling, especially with a weapon like Reed.